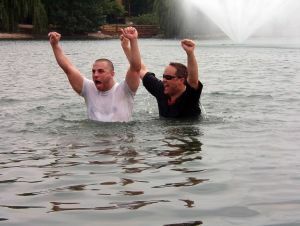 Many people who were baptised as babies or come to faith later in life want to publicly declare their love for Jesus. Confirmation is a re-affirmation of your baptism vows. Anyone can be confirmed at any age! At Uplyme Church we do confirmation in the summer – when the weather is warmer – and one option is to re-affirm your vows with full-immersion in the sea at Lyme Regis. Some adults may well be baptised at the same time.